Hair transplantation is a surgical technique that removes hair follicles from one part of the body, called the 'donor site', to a bald or balding part of the body known as the 'recipient site'. The technique is primarily used to treat male pattern baldness. In this minimally invasive procedure, grafts containing hair follicles that are genetically resistant to balding (like the back of the head) are transplanted to the bald scalp. Hair transplantation can also be used to restore eyelashes, eyebrows, beard hair, chest hair, pubic hair and to fill in scars caused by accidents or surgery such as face-lifts and previous hair transplants. Hair transplantation differs from skin grafting in that grafts contain almost all of the epidermis and dermis surrounding the hair follicle, and many tiny grafts are transplanted rather than a single strip of skin. For several days prior to surgery the patient refrains from using any medicines which might result in intraoperative bleeding and resultant poor grafting. Alcohol and smoking can contribute to poor graft survival. Post operative antibiotics are commonly prescribed to prevent wound or graft infections. There are two main ways in which donor grafts are extracted today: strip excision harvesting, and follicular unit extraction. Strip harvesting is the most common technique for removing hair and follicles from a donor site. The surgeon harvests a strip of skin from the posterior scalp, in an area of good hair growth. A single-, double-, or triple-bladed scalpel is used to remove strips of hair-bearing tissue from the donor site. Each incision is planned so that intact hair follicles are removed. The excised strip is about 1–1.5 x 15–30 cm in size. While closing the resulting wound, assistants begin to dissect individual follicular unit grafts, which are small, naturally formed groupings of hair follicles, from the strip. Working with binocular Stereo-microscopes, they carefully remove excess fibrous and fatty tissue while trying to avoid damage to the follicular cells that will be used for grafting. The latest method of closure is called 'Trichophytic closure' which results in much finer scars at the donor area. The surgeon then uses very small micro blades or fine needles to puncture the sites for receiving the grafts, placing them in a predetermined density and pattern, and angling the wounds in a consistent fashion to promote a realistic hair pattern. The technicians generally do the final part of the procedure, inserting the individual grafts in place. Strip harvesting will leave a thin linear scar in the donor area, which is typically covered by a patient's hair even at relatively short lengths. The recovery period is around 2 weeks and will require the stitches/staples to be removed by medical personnel or sub cuticular suturing can be done. FUE can give very natural results. The advantage over strip harvesting is that FUE harvesting negates the need for large areas of scalp tissue to be harvested, so there is no linear incision on the back of the head and it doesn't leave a linear scar. Because individual follicles are removed, only small, punctate scars remain which are virtually not visible and any post-surgical pain and discomfort is minimized. As no suture removal is required, recovery from Micro Grafting FUE is less than 7 days. Robotic hair restoration devices utilize cameras and robotic arms to assist the surgeon with the FUE procedure. In 2009, NeoGraft became the first robotic surgical device FDA approved for hair restoration. The ARTAS System was FDA approved in 2011 for use in harvesting follicular units from brown-haired and black-haired men. Despite the advantages of robotic hair restoration systems, there are still some disadvantages such as the size of the punches being relatively large in comparison to what is used in other methods of FUE, and the high costs associated with the devices. If donor hair numbers from the back of the head are insufficient, it is possible to perform body hair transplantation (BHT) on appropriate candidates who have available donor hair on the chest, back, shoulders, torso and/or legs. Body hair transplant surgery can only be performed by the FUE harvesting method and, so, requires the skills of an experienced FUE surgeon. However, there are several factors for a potential BHT candidate to consider prior to surgery. These include understanding the natural difference in textural characteristics between body hair and scalp hair, growth rates, and having realistic expectations about the results of BHT surgery. Advances in wound care allow for semi-permeable dressing, which allow seepage of blood and tissue fluid, to be applied and changed at least daily. The vulnerable recipient area must be shielded from the sun, and shampooing is started two days after the surgery. Some surgeons will have the patient shampoo the day after surgery. Shampooing is important to prevent scabs from forming around the hair shaft. Scabs adhere to the hair shaft and increase the risk of losing newly transplanted hair follicles during the first 7 to 10 days post-op. During the first ten days, some of the transplanted hairs, inevitably traumatized by their relocation, may fall out. This is referred to as "shock loss". After two to three months new hair will begin to grow from the moved follicles. The patient's hair will grow normally, and continue to thicken through the next six to nine months. Any subsequent hair loss is likely to be only from untreated areas. Some patients elect to use medications to retard such loss, while others plan a subsequent transplant procedure to deal with this eventuality. Hair thinning, known as "shock loss", is a common side effect that is usually temporary. Bald patches are also common, as fifty to a hundred hairs can be lost each day. Post-operative hiccups have also been seen in around 5% of transplant patients. 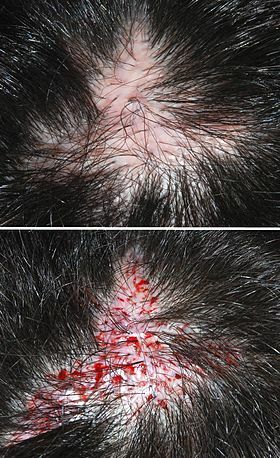 The use of both scalp flaps, in which a band of tissue with its original blood supply is shifted to the continue bald area, and free grafts dates back to the 19th century. In 1897, Menahem Hodara successfully implanted hair taken from the unaffected areas of the scalp on to the scars that were left bald by favus. Modern transplant techniques began in Japan in the 1930s, where surgeons used small grafts, and even "follicular unit grafts" to replace damaged areas of eyebrows or lashes, but not to treat baldness. Their efforts did not receive worldwide attention at the time, and the traumas of World War II kept their advances isolated for another two decades. The modern era of hair transplantation in the western world was ushered in the late 1950s, when New York dermatologist Norman Orentreich began to experiment with free donor grafts to balding areas in patients with male pattern baldness. Previously it had been thought that transplanted hair would thrive no more than the original hair at the "recipient" site. Orentreich demonstrated that such grafts were "donor dominant," as the new hairs grew and lasted just as they would have at their original home. Advancing the theory of donor dominance, Walter P. Unger, M.D. defined the parameters of the "Safe Donor Zone" from which the most permanent hair follicles could be extracted for hair transplantation. As transplanted hair will only grow in its new site for as long as it would have in its original one, these parameters continue to serve as the fundamental foundation for hair follicle harvesting, whether by strip method or FUE. For the next twenty years, surgeons worked on transplanting smaller grafts, but results were only minimally successful, with 2–4 mm "plugs" leading to a doll's head-like appearance. In the 1980s, strip excisions began to replace the plug technique, and Carlos Uebel in Brazil popularized using large numbers of small grafts, while in the United States William Rassman began using thousands of “micrografts” in a single session. In the late 1980s, B.L. Limmer introduced the use of the stereo-microscope to dissect a single donor strip into small micrografts. The follicular unit hair transplant procedure has continued to evolve, becoming more refined and minimally invasive as the size of the graft incisions have become smaller. These smaller and less invasive incisions enable surgeons to place a larger number of follicular unit grafts into a given area. With the new "gold standard" of ultra refined follicular unit hair transplantation, over 50 grafts can be placed per square centimeter, when appropriate for the patient. Surgeons have also devoted more attention to the angle and orientation of the transplanted grafts. The adoption of the “lateral slit” technique in the early 2000s, enabled hair transplant surgeons to orient 2 to 4 hair follicular unit grafts so that they splay out across the scalp's surface. This enabled the transplanted hair to lie better on the scalp and provide better coverage to the bald areas. One disadvantage however, is that lateral incisions also tend to disrupt the scalp's vascularity more than sagittals. Thus sagittal incisions transect less hairs and blood vessels assuming the cutting instruments are of the same size. One of the big advantages of sagittals is that they do a much better job of sliding in and around existing hairs to avoid follicle transection. This certainly makes a strong case for physicians who do not require shaving of the recipient area. The lateral incisions bisect existing hairs perpendicular (horizontal) like a T while sagittal incisions run parallel (vertical) alongside and in between existing hairs. The use of perpendicular (lateral/coronal) slits versus parallel (sagittal) slits, however, has been heavily debated in patient-based hair transplant communities. Many elite hair transplant surgeons typically adopt a combination of both methods based on what is best for the individual patient. ^ "An Update on Diagnosis and Treatment of Female Pattern Hair Loss". Medscape Logo. Retrieved 30 May 2018. ^ Singhal, Hemant. "Wound Infection Medication". medscape. Retrieved 30 May 2018. ^ "FUE Hair Transplant Procedure - International Society of Hair Restoration Surgery". ishrs.org. ^ Onda M, Igawa HH, Inoue K, Tanino R (Dec 2008). "Novel technique of follicular unit extraction hair transplantation with a powered punching device". Dermatol Surg. 34: 1683–8. doi:10.1111/j.1524-4725.2008.34346.x. PMID 19018825. ^ a b Rassman WR, Bernstein RM, McClellan R, Jones R, et al. (2002). "Follicular Unit Extraction: Minimally invasive surgery for hair transplantation". Dermatol Surg. 28 (8): 720–7. doi:10.1046/j.1524-4725.2002.01320.x. ^ Harris JA (Nov 2008). "Follicular unit extraction". Facial Plast Surg. 24: 404–13. doi:10.1055/s-0028-1102904. PMID 19034817. ^ L.Williams, Ken (2013). "Current Practices and Controversies in Cosmetic Hair Restoration" (PDF). CONTROVERSIES IN COSMETIC HAIR RESTORATION. ^ M, Rashid, Rashid; Morgan, Bicknell, Lindsay T (1 September 2012). "Follicular unit extraction hair transplant automation: Options in overcoming challenges of the latest technology in hair restoration with the goal of avoiding the line scar". Dermatology Online Journal. 18 (9). ^ "Hair transplant robot gets FDA approval, men with straight brown hair rejoice". Engadget. Retrieved 2017-12-22. ^ Parsa Mohebi, (2013). MODERN HAIR RESTORATION - A Complete Hair Loss Guide For Men And Women. 1st ed. ^ Okuda S (1939). "The study of clinical experiments of hair transplantation". Jpn J Dermatolurol. 46: 135. ^ Orentreich, Norman (1959). "Autografts in Alopecia and Other Selected Dermatologic Conditions". Annals of the New York Academy of Sciences. 83: 463–479. doi:10.1111/j.1749-6632.1960.tb40920.x. ^ Unger WP (1994). "Delineating the 'Safe' Donor Area for Hair Transplanting". The American Journal of Cosmetic Surgery. 11: 239–243. ^ Alam, Murad. Evidence-Based Procedural Dermatology. Springer November 2011; 382-3. This page was last edited on 23 October 2018, at 00:29 (UTC).